The fiery Kula-Kundalini in the Muladhara-Chakra within the RA-triangle. 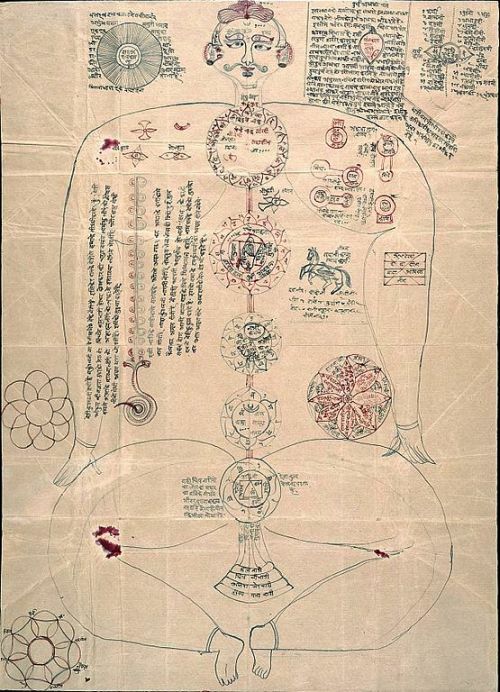 The Prana-Kundalini within the Swadhisthana-Chakra with its pranamaya-kosha. The purpose of Kundalini-Yoga is to clean the channels (nadis) for the Kundalini-energies and later to awaken the Kula-Kundalini up to the highest Chakra and so to reach Moksha after a long practice. There are two main forms of the respective Yoga : Kundalini-Yoga and Laya-Kundalini-Yoga. Kundalini - Yoga cleans the channels and awakens the Kundalini. Physical effects are believed to be a sign of Kundalini awakening by some, but they can also be harmful. Many scools practice Asanas and extreme breath-exercises to awaken the Kundalini. Therefore are Pranayama - exercises with purification of the forces of the Prana -Kundalini an essential preparation. Techniques together with mantras are described in the Kundalini-Upanishad. A more subtle version of the Kundalini-Yoga is the Laya-Yoga. Laya-Yoga is based on an old meditation form with concentration on the energy centers or chakras. The Nepalese way Gorakshnatha, a student of Matsyendranath, is regarded as the founder of Laya Yoga. According to the theory exist five centers of energy in the spine and two centers in the head. Laya Yoga tries to locate them through meditation, and also to absorb images and words and channel the prana energies. The kundalini is subtly aroused and channeled and transformed by the chakras. Practicing also includes concentration on different parts of the body, on energy perceptions and feelings, without using words and images. After becoming aware of the essence of feelings and thoughts, they are dissolved in pure energy in order to experience the energy of the primordial energy or Shakti behind all thoughts and emotions, which then leads to the pure awareness of Shiva. Breath control and the use of various seals (mudra) from the Hatha Yoga as well as mantras such as Wahe Guru, Wahe Guru, Wahe Wahe Wahe Guru and others are further practices.